This October 1941 cartoon appeared in a popular New York newspaper called PM. It was one of 400 World War II-era political cartoons created by Theodor Seuss Geisel (later known as Dr. Seuss). It expresses concern about the recent Nazi invasion of Russia, but pride in the success of US naval forces, newly engaged in the war effort, against Nazi submarines. 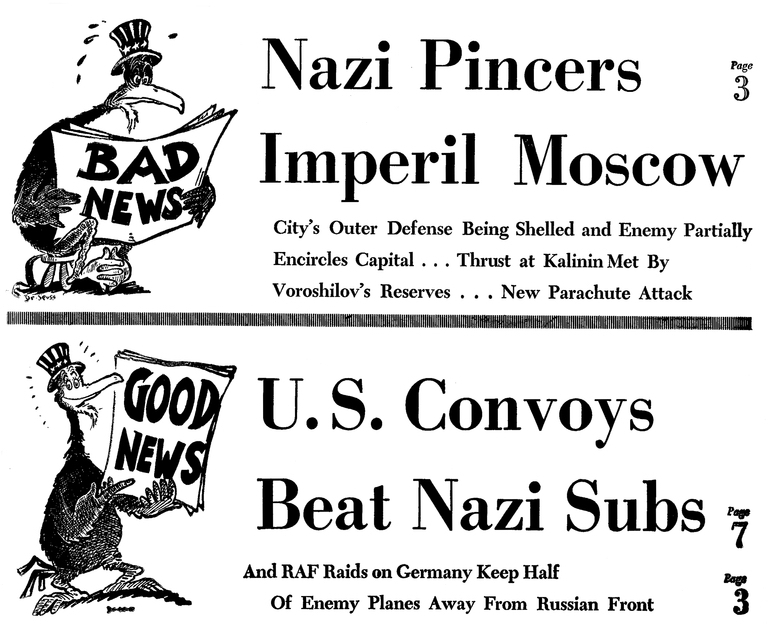 Seuss, Dr., “Nazi Pincers Imperil Moscow / U.S. Convoys Beat Nazi Subs,” Digital Public Library of America, https://dp.la/item/d56f66eabc59fa5c9d24fe2fad906706. Courtesy of UC San Diego, Library, Special Collections and Archives via California Digital Library.